Yahoo Answers Fraud + Google Adwords Fraud = SEO + SEM Gain? By David Rodnitzky on 06/20/2008 in "Analytics Blogs"
This scam is not complicated, but it needs a little explanation, so work with me here. It’s Yahoo Answers. So perhaps this is a way for Yahoo Answers to drive more traffic to their site? Perhaps, but look at the answer from “Tammy Jones”: she happens to be recommending a Web site that reviews wrinkle creams (and gets affiliate revenue every time someone buys something on the site). The answer to Tammy’s question just happens to be a reference to the same Web site that Tammy referred another user to when she answered a question about a cosmetic. So what does all this mean? Well, this is basically a coordinated attempt by “Consumer Health Digest” to skirt both Yahoo and Google’s terms and conditions and simultaneously receive both SEO and SEM benefit. The first part of the scam – advertising a link from “Yahoo” on Google AdWords, is a crafty way to violate Google’s “double serving” policy. In other words, Consumer Health Digest can run an ad for their own URL and also run an ad for this Yahoo Answers result on the same keyword, thus getting more “shelf space” on AdWords, which Google does not allow. The second part of the scam is a way to get in-bound links from Yahoo to your site for SEO purposes. 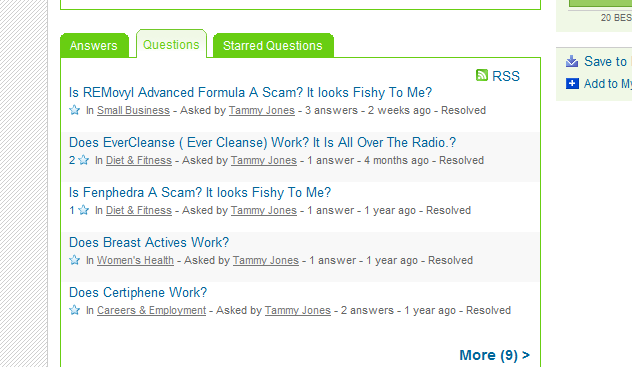 Consumer Health has created numerous Yahoo Answers accounts and basically “asked” questions that they immediately “answer” with a link to their Web site. This has a double benefit – first, it gives their site some link juice from Yahoo. Second, since Yahoo Answers results tend to show up highly in the search results, adding a URL to a Yahoo Answers question and answer gives Consumer Health ‘another bite at the apple’ for organic results as well. At the end of the day, none of this is particularly sneaky, and none of it is particularly smart. If I could figure this out in a few minutes, I imagine that the folks at Yahoo Answers and Google AdWords could do it in a matter of seconds. And having your site banned by both Yahoo and Google on both organic and paid listings is not a good way to build a business! 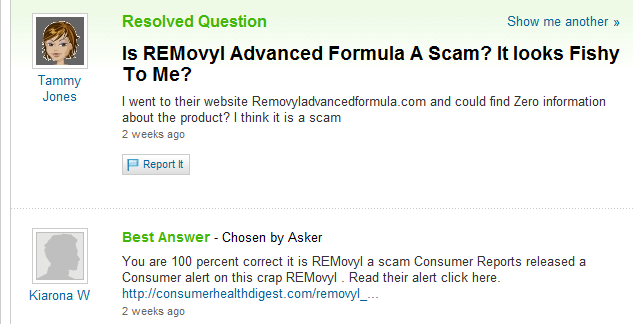 3 Responses to Yahoo Answers Fraud + Google Adwords Fraud = SEO + SEM Gain? To be very true, everyone knows what you want to prove. Perhaps there will be a few users who will be real and asking something truly, all others are just there to drive traffic to different sites. If this is the case, qaswer, then does Yahoo Answers have much of a chance to survive? You would think that this would be the #1 priority for the team at Yahoo Answers to fix. I'm going to be a contrarian here and say that this seems like much ado about nothing. So consumerhealthdigest is a little sneaky. Big deal. Goldman Sachs steals $100,000,000 every single day. Not saying that the defacement of Yahoo! Answers with spammy links is not a great scourge and a pox upon our society, but it's not high on my list of social evils.